Salsify is a new adventure for us in the garden. We’ve never grown it before but from now on it’s going to be an annual crop. It’s very easy to cultivate and makes a welcome change at this time of the year, when the kitchen garden is looking a bit sad. It looks like a long skinny parsnip and is said to taste of oysters. I don’t know who thought that one up, as to me its flavour is more reminiscent of celeriac, with a smidgeon of jerusalem artichoke and parsnip thrown in for good measure. I think it’s delicious and it pairs very well with game. 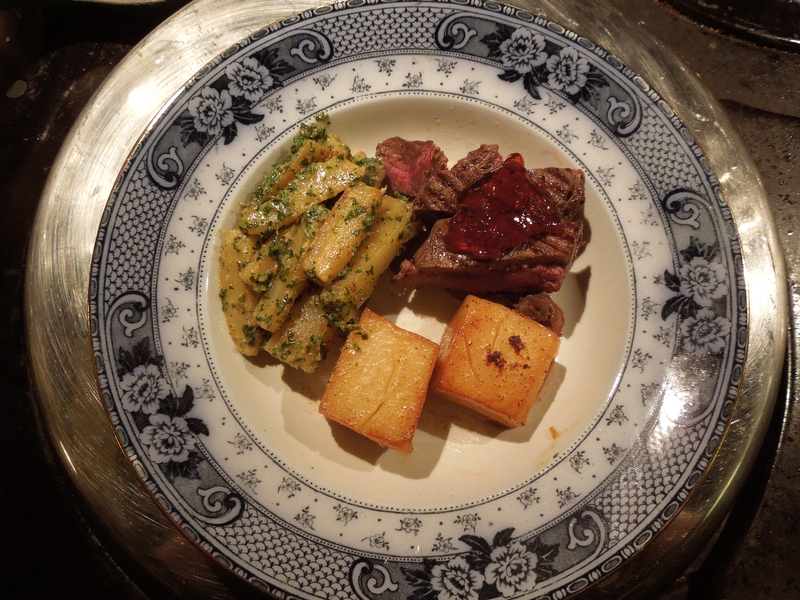 We cooked it with garlic-scented fondant potatoes and seared venison fillets. Add a dollop of jewel-bright quince or redcurrant jelly and it’s a marriage made in heaven. This is emphatically not, however, a low-fat dish. Believe it or not, I cut the amount of butter in the potato fondant recipe by a third. Fill a large saucepan with enough water to cover the salsify and add the juice of a lemon and a tablespoon of plain flour and stir well. It looks revolting but the lemon juice and flour help keep the roots white when they’re cooking – they turn brown in the blink of an eye. 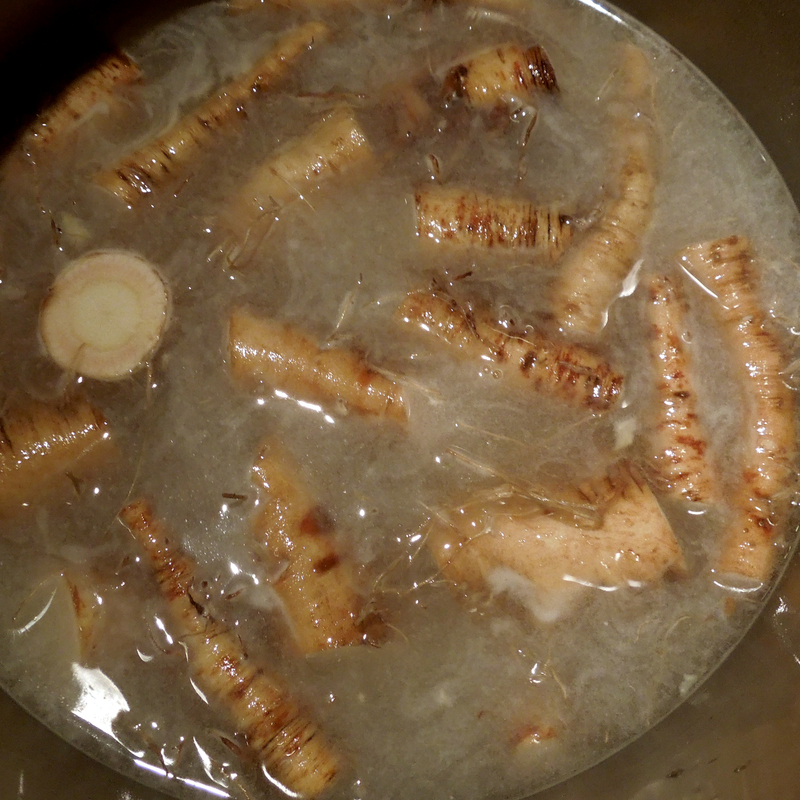 Trim and scrub the salsify, cut them into large chunks and drop them, unpeeled, into the acidulated water. 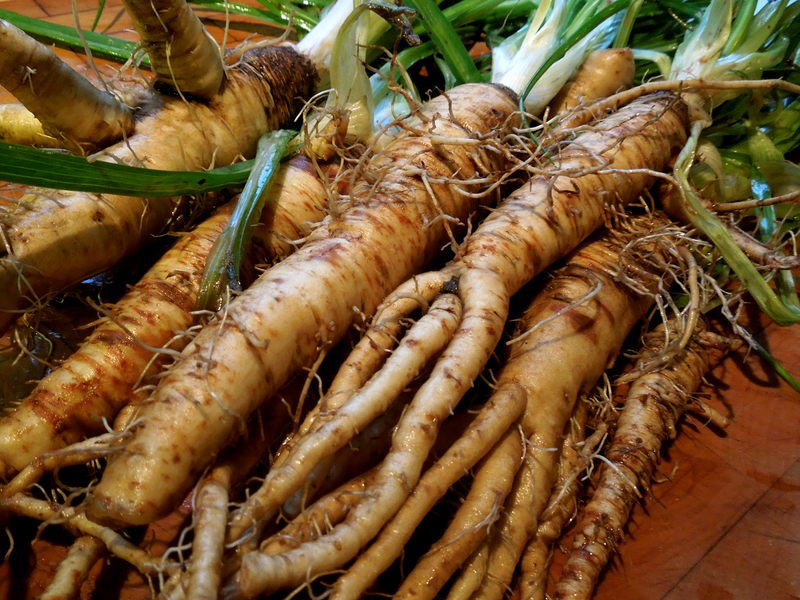 Place on the stove, bring to the boil, then simmer until the salsify is tender – you should be able to pierce it with a knife. Drain and plunge into cold water. When cool enough to handle, peel off the skin and cut the roots into batons. 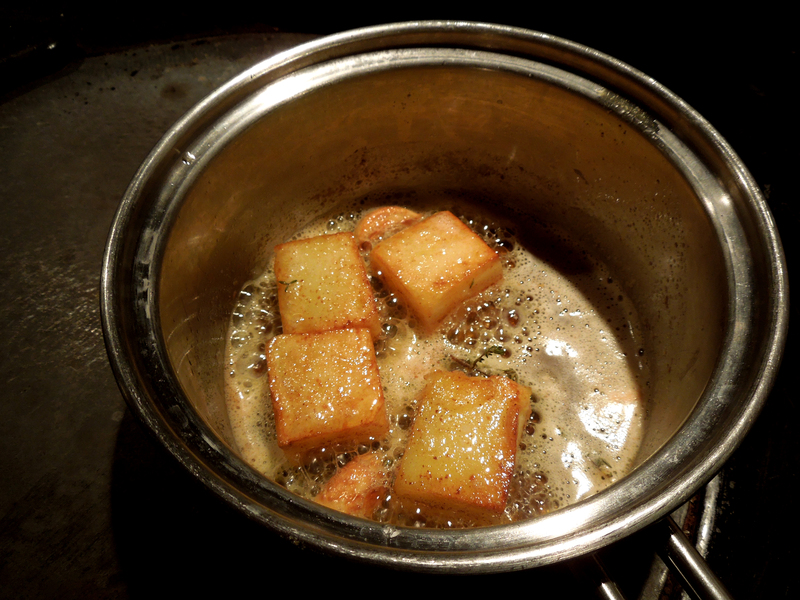 Just before you’re ready to eat, heat the knob of butter with the oil in a pan and fry off the salsify until it’s tinged with gold. Pour in a splash of cream and the parsley and stir until the cream has thickened. Set aside to keep warm. For the fondant potatoes, peel the potatoes and cut into either fat rectangles or into circles (using a pastry cutter). Heat the butter in a saucepan and when it’s foaming, put in the potatoes with the garlic, peeled and lightly crushed with the flat of a knife, and the thyme. Cook the potatoes for 5-6 minutes without moving them until brown on one side, then turn them over and brown the other side, another 5-6 minutes. Pour in the chicken stock, clamp a lid on and bring to a simmer. 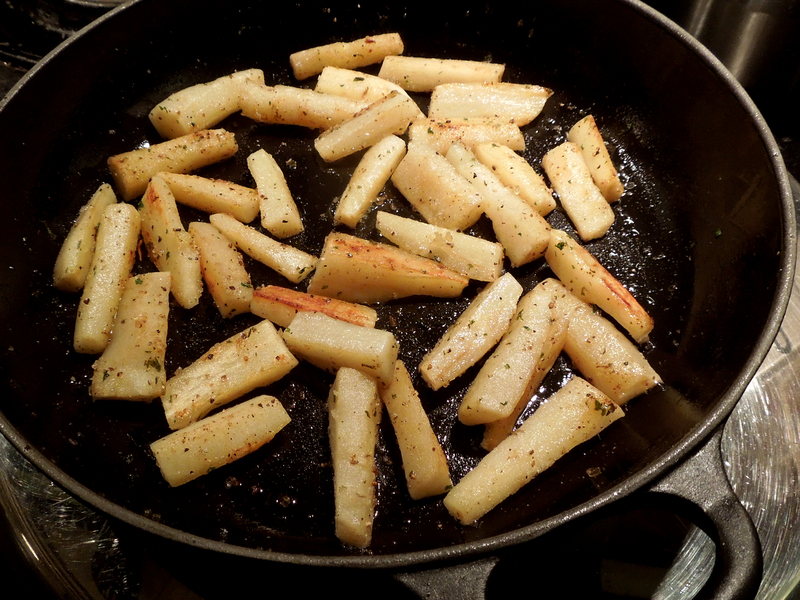 Cook until the potatoes are tender all the way through when pierced with a knife. Set aside to keep warm. Heat a griddle pan until it’s smoking. Rub the venison fillets with a little oil and season well. Drop them into the griddle pan and cook for about three minutes on one side, then turn them over and cook for another minute for medium-rare (depending on thickness). Allow to rest for five minutes before serving with the vegetables. 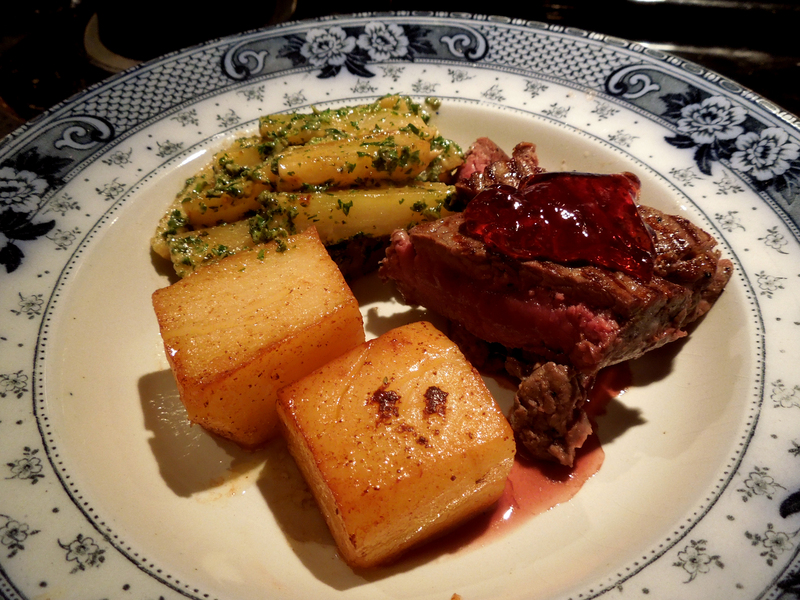 This entry was posted in Game, Mains, Vegetables and salads and tagged fondant potatoes, salsify, seared venison fillets by Linda Duffin. Bookmark the permalink. Salsify is a new one for me, never tried it before. Looks like great meal! Us neither, but I’m a convert. Thank you for the kind words! Thank you. It’s a new one for me too but I really like it. A friend told me today he once ruined a saucepan cooking it because it contains latex! I didn’t see any signs of it though and it definitely wasn’t rubbery ….